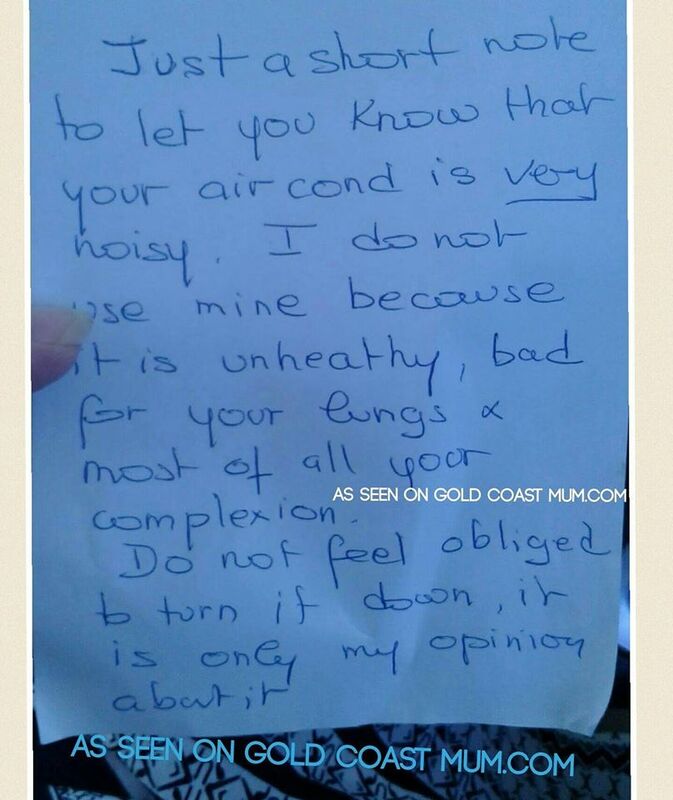 A friend received this note today whilst sitting in her parked car outside a #goldcoast school. Her baby was sleeping in the car and she had the air-conditioning running - as many parents do in warm weather - while waiting to do school pick-up. A women aged in her 50s tapped on the window & hand-delivered this note. "Just a short note to let you know that your air con is very noisy. I do not use mine because it is unhealthy, bad for your lungs & most of all your complexion. Do not feel obliged to turn it down, it is only my opinion about it." "& most of all your complexion". Seriously? Never mind the apparent 'health' issues that in-car aircon can cause. It's our COMPLEXION that we should all be prioritising. Should babies and toddlers (& children, adults and elderly) be forced to sit in sweltering conditions to avoid such a risk to their precious complexion? On a day like today, when the outside temperature was mid-30s, temps can reach 50 degrees+ in just a matter of minutes in an UN-airconditioned car. I think that's more of concern, don't you? Since when has it been OK for a stranger to share such 'advice'. The mum who received the note, was shocked and responded with "I have a baby sleeping in the car". Friends have since told the mum she should have told the lady to take her opinion and shove it where the sun doesn't shine. Should people keep such opinions to themselves? What random advice/unwanted opinions have you received?